One of the things I love about art history is that art is a visual manifestation of the historical context of its day. I think that a historian can always pinpoint some type of motivation/historical context for the production of a work of art. Often, it is when I am looking at the historical framework that I experience my “a-ha!” moments of art historical enlightenment. I always get excited when I come up with historical connections on my own. Even if sometimes I see later that another historian already made the connection, I still like to pat myself on the back for at least finding the same correlation. The Baroque period of the 17th century was essentially shaped and defined by the Counter-Reformation of the Catholic church, an event which began in the 16th century. Martin Luther’s reformation (begun 1517) and the rise of Protestantism was a threat to the Catholic church; the Counter-Reformation was the Catholic movement to counteract the Reformation. Essentially, the Counter-Reformation was an attempt to bring back the “lost sheep” of Catholic congregations that had fallen-in with the Protestants. Luther and the Protestants found that there were many problems in the Catholic church, such as the sale of indulgences and the veneration of saints. Canons and decrees were issued by the Catholic church to rebuttal claims made by the Protestants. One way that the art of the Baroque period is influenced by the Counter-Reformation is through its dramatic style and composition – plunging diagonals, dramatic lighting and shallow picture planes are supposed to involve the viewer, or make the viewer feel as if he or she is part of the work of art. The art serves as a type of propaganda to help the viewer experience the majesty of the Catholic church first-hand, an experience that would be an aid for conversion. In addition to style, Baroque art is also influenced by subject matter. The Council of Trent asserts the importance of the veneration of saints, which subsequently led to many depictions of saints in Catholic art at this time. This brings me back to Saint Jerome. 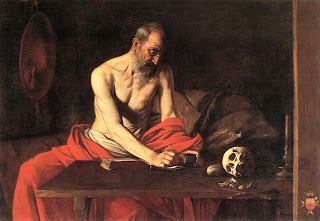 I always considered depictions of Saint Jerome to fit into the generalized propaganda for saints and their veneration, but I realized that there really is much more. 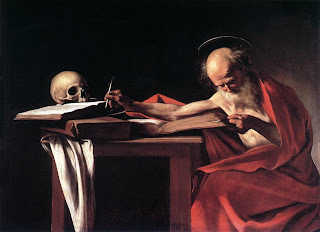 You see, Saint Jerome is the saint who is responsible for translating the Vulgate from Hebrew and Greek into Latin. The Catholics wanted to justify the use of the canonized Latin text, which was in opposition to the Protestants who felt that the Bible should be translated into the local vernacular. Therefore, not only do depictions of Saint Jerome assert the validity and importance of saints, but these works of art are also a plug for the use of the Latin text within the church! There are many depictions of Saint Jerome from this period, and now I can see why. It’s dual propagandistic in purpose – the Catholics could get two propagandistic statements out of one artistic commission. Isn’t it absolutely fascinating how perfectly these depictions reveal the historical context and sentiment of their day? *Sigh* – it’s so great. I wish that museum labels could be long enough to explain all of these historical intricacies – they make works of art infinitely more interesting. So, keep your eyes out for Baroque depictions of Saint Jerome. You can’t miss him – he’s often working on his Vulgate translation and is typically identified by a skull (man is born to die but the Word is eternal). The paintings included in this post are both by Caravaggio. The first one is from about 1607-08, and the second one was made slightly earlier, about 1605. Last week before visiting the opening of the new exhibition at the MOA, “Turning Point: The Demise of Modernism and Rebirth of Meaning in American Art,” J and I listened to an interview on the radio with Campbell Gray, the museum director. I took an art theory class from Campbell last Fall, and it was one of my favorite courses in my whole graduate career. He’s a very intelligent man and ran his class in a very Socratic fashion. I felt like he was also coming to conclusions and learning along with the rest of the class – it was great. This MOA exhibition is really fabulous and ground-breaking in its theoretical base. I just hope that the museum audience realizes how fantastic this is – I have already discussed how a large part of the BYU student populous has a distaste for modern and contemporary art. Perhaps this show will help people to realize the theories and ideas that are behind the modern and minimalistic aesthetic. I’m just glad to see an exhibition in the MOA displaying art that isn’t from the 19th century! Anyhow, in this interview Campbell made an interesting point about conceptual art. For those of you who are unfamiliar with conceptual art, it is a movement which started in the 60s that stressed emphasis on the concept or idea behind the work of art (instead of the artistic object itself). A famous example of conceptual art is “One and Three Chairs” by Joseph Kosuth. Here, Kosuth includes three manifestations of a chair: a dictionary definition of a chair, a physical chair, and a photograph of a chair. 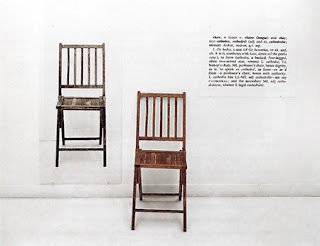 Essentially, Kosuth is examining the nature of a “chair” or the concept of “chairness,” if you will. Campbell said in this interview that this shift to conceptual art was a radical change in the art world, mainly because the work of art now is located in the mind of the viewer and not in the physical manifestation of the object. The physical objects shown in the gallery are only material “triggers” to help bring about the actual work of art – the concept. Does anyone else find conceptual art to be aesthetically pleasing? I find conceptual art to be more intellectually stimulating and interesting than physically beautiful, but I can see where J is coming from and wonder if other people feel the same way. Along these same lines, where does the concept of beauty fit in regards to ideas and concepts? Isn’t it interesting that ideas can be beautiful, but it is a different type of beauty than aesthetic beauty and taste? I’d love to discuss this subject with Kant and hear what he has to say. As an art historian, I’ve always been interested in Hegel’s concept of the Geist. For those of you unfamiliar with Hegel, he was an 18th/19th century philosopher who believed that there was a “world spirit” that manifested itself in art, religion, and philosophy. The Geist continues to develop and evolve throughout history; essentially, due to the Geist (almost as a type of driving force for the history of the world), things develop and evolve at the time and rate that they are supposed to. One reason why Hegel is important to art history is because of his classification and discussion of how art has developed. Hegel found that art developed in three stages: Symbolic (prehistoric, Egyptian), Classical (Greek), and Romantic (post-Classical, i.e., Christian). In this final Romantic phase, Hegel discusses how art has become spiritualized in nature. Had Hegel lived into the early 20th century, I wonder if he would have added an additional phase which could have focused on formalism. The thing I find so fascinating about these formalistic changes in music is that the same thing happened art historically. In 1907-08 (note the date again! 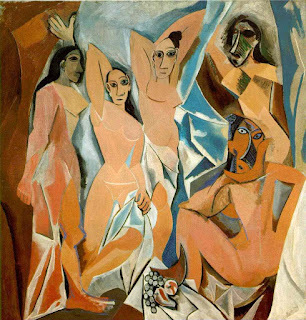 ), Picasso created “Les Demoiselles D’Avignon,” the seminal early Cubist painting which revolutionized the meaning and creation of art. The Cubist style, with the breaking down and exploration of forms, is also formalist in nature. Even the flatness associated with the Cubist style is a recognition of the flat form of the canvas – a flatness which artists tried to escape or deny with illusionistic art that began in the Renaissance. 1 Schoenberg said, “I am convinced that eventually people will recognize how immediately this ‘something new’ is linked to the loftiest models that have been granted us. I venture to credit myself with having written truly new music which, being based on tradition, is destined to become tradition.” (See J. Peter Burkholder, Donald J. Grout and Claude V. Palisca, A History of Western Music, 7th ed., (New York: W. W. Norton and Company, 2006, 804). It is also interesting to note that Schoenberg was against using the term “atonal.” He said, “The word ‘atonal’ could only signify something entirely inconsistent with the nature of tone. . . . [T]o call any relation of tones atonal is just as farfetched as it would be to designate a relation of colors aspectral or acomplementary. There is no such antithesis.” (See Arnold Schoenberg, Theory of Harmony, translated by Roy Carter, (Berkeley & Los Angeles: University of California Press, 1978, 432)). Therefore, it appears that Schoenberg did not feel like he was “going against” anything musical with his usage of tones. 2 This information was given in J’s lecture, so I can’t cite a specific source. It appears that his “Poem of Ecstasy” was written in 1908, so this may be the work to which J’s teacher referred. I will need to do a little more research though. From what I have found on this less-credible source, however, Scriabin began working on atonality from 1903-08. Even if this was the case, the close connection between Scriabin and Schoenberg’s interests in atonality can still fit into this idea of Geist. It would just be cooler if it all happened in 1908.